Three Best Books to Understand Bucklin Family Roots of 1630 to 1799! Every Bucklin should have the following three books for understanding (1) the American Revolutionary War, in which so many Bucklins were involved, (2) the 1772 Gaspee Attack that included Joseph Bucklin V, and (3) who were your original Bucklin ancestors the America, and what they did that was important to the start of Rhode Island and the United States. If you want something portable, with a readable style, fun to read, that gives you a good general overview of the Revolutionary War, get this book. We recommend this as perhaps the best condensed version of the American Revolution history. It’s by one of America’s best historians, a man known for his scholarship and devotion to the history of the Revolutionary and Colonial periods. This is the basic collection of the original documents about the burning of the British revenue schooner, the HMS Gaspee, in Rhode Island waters in June of 1772, and the English attempt to capture the participants. No serious student of the history of the capture of the Gaspee should be without this book. Originally written for the Providence Gazette in 1845 by William Staples; modern forward by Richard Deasy, Professor of History, Providence College. 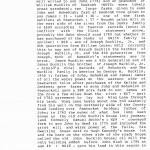 Starting with William Bucklin in 1643, the activities and families of several Bucklin generations until 1799 can be traced through the records of the Pawtucket area. Because of William Bucklin’s large landholdings at an important part of the East Providence riverbank, Pawtucket and the Bucklin family are forever linked together in history. This is an fascinating book for Bucklins to read. For example — Volume I of the History of Pawtucket has 1691, 1718 and 1755 maps, which can only be found in these books. These maps show graphically the divisions of William Bucklin’s original 600 acres through the years from Williams first purchase in about 1641 until pre-Revolutionary War times. Purchased by Bucklin as a part of pure wilderness, this land descended among his male heirs through a century. No serious historian or genealogist of the Bucklin family should be without this book! Always buy the Volume II, the huge index with substantial annotations (click on thumbnail below to see what we mean) if you buy Volume I. The index to Volume I (The index is sold separately as Volume II) has over 18 pages of annotated index entries about the Bucklins before the American Revolution. Incredible detail of early generations of the Bucklin family is found throughout Volume I, and you can go directly to it though the entries in the annotated index (Volume II). 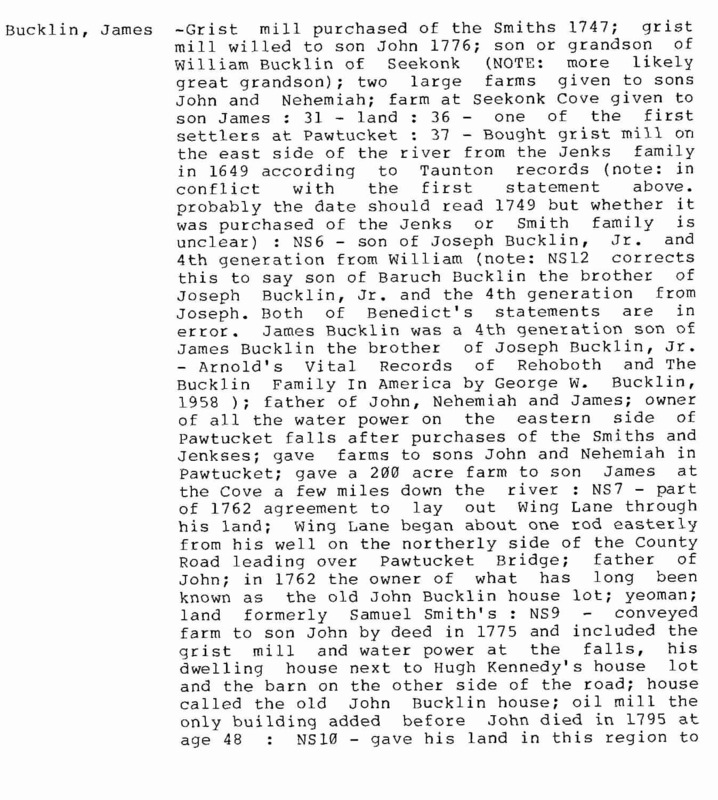 Click on the thumbnail to the left to look at a sample of the rich content of the index entries about Bucklins. It’s an index worth studying. If you are a Bucklin, get the index (Vol. II), as well as Volume I. The bookstores (including Amazon) will tell you this book is out of print and unavailable. The now now deceased female author and the now elderly male authors, bless their hearts, printed the books and sold them privately but no longer sell them. You are in luck, because we are the only place that has made a special arrangement with the Pawtucket Library. That library has a few extra copies that they will sell. Volume I, “History of Pawtucket Rhode Island: Reminiscences”, is $25.00; and the Volume II, “The Annotated Index””, is $15.00. They also charge you $10.00 for shipping and handling. Make a check payable to the Friends of the Pawtucket Public Library and send it to: Reference Librarian, Pawtucket Public Library, 13 Summer Street, Pawtucket, RI 02860. They will then pack and ship the books via UPS. We do not get a commission on this sale, it’s just a public service, because we think the book is an important link to Bucklin family history.